There’s nothing like watching professionally edited racing highlights from 80+ years ago. It’s the Pau Grand Prix and Tazio Nuvolari is on pole. Would you ever have guessed that shooting in-car footage was possible way back in 1935? Yet that is just what you can see in the above video, a summary of the 1935 Pau Grand Prix. At a brisk 84 seconds, it is teeming with excellent visuals, including cars speeding past placid swans on a lake. The first race at the city circuit of Pau—a town in Southwest France near the border with Spain—was held in 1901 and it was the very first motor race called a grand prix. Over the years, it has been organized in various guises, slipping in rank from pre-war Formula Libre and post-war Formula One races to Formula Two, 3000 and Three, all the way to the WTCC races held since 2007 (on a sad note, after an unbroken run of events since the 1957 Formula One race, the 2010 Pau race has been cancelled). Just as expected the Ferrari cars took control over the race with Nuvolari leading from Dreyfus. The only driver being able to challenge them was Étancelin but he had to retire with a broken oil pump. 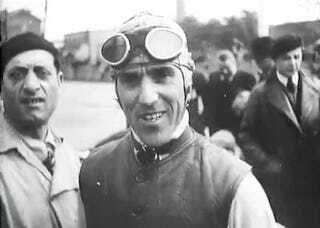 At half distance Dreyfus led Nuvolari by 2 seconds with Falchetto third, one minute behind. Five laps from the finish Nuvolari passed Dreyfus and the Alfa Romeo drivers then cruised home to give Nuvolari a straight win in his comeback race for Ferrari. Four minutes behind them two Maseratis were fighting for third place and the cars actually collided once they had passed the line. Just one of many victories over Nuvolari’s remarkable career, with a hat trick of pole, fastest lap and race win.